Natural alternatives to foam insulation are highly desirable for high-performing wood-framed buildings. But lignocellulosic materials can be highly bio-nutritive and moisture absorptive, increasing their vulnerability to degradation and reduced thermal performance. Designers are often faced with the dilemma of selecting materials that are less environmentally safe for much improved performance. 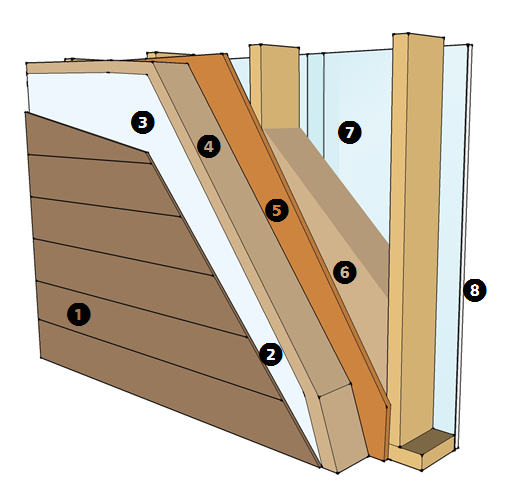 In this article, I describe a highly resilient R-30 wall comprised entirely of wood and other lignocellulosic materials. Its moisture performance may surprise you. We put this wall through some grueling measures. First we started with a harsh Minnesota climate with a north-facing orientation. We then added a 1% wind-driven rain load against the protected exterior insulation and an additional 0.5% load against the unprotected sheathing! Performance is enhanced by a generous 0.75” ventilated rainscreen, but diminishing its dept to 3/8” and 20 ACH has no deleterious effects. Subsequent studies also successfully increased the rain exposure factor and deposition factors in excess of typical design conditions. 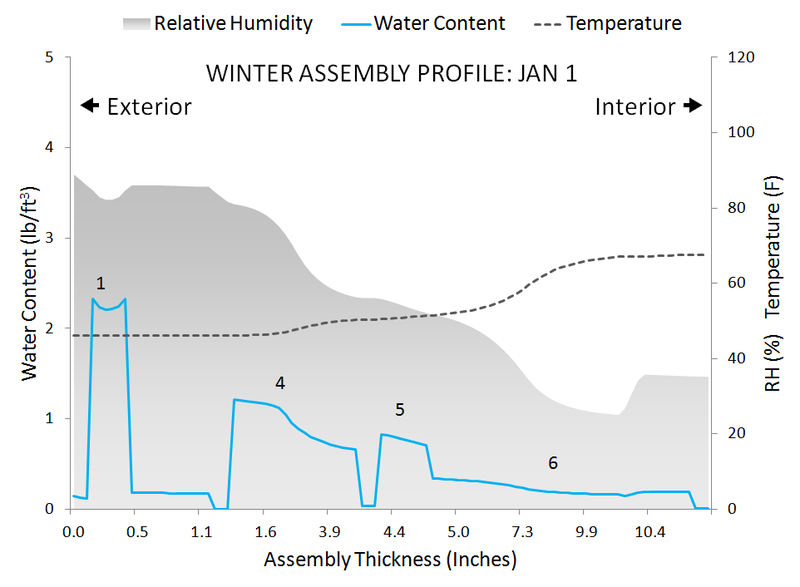 The winter wall profile illustrates moisture, relative humidity, and temperature as you move from exterior (left side) to interior (right side). Although relative humidity approaches 80% at the outer realm of the exterior insulation, it comes nowhere close to reaching a thirty-day running average above 41°F – ASHRAE 160’s minimum threshold. All components show normal moisture levels. 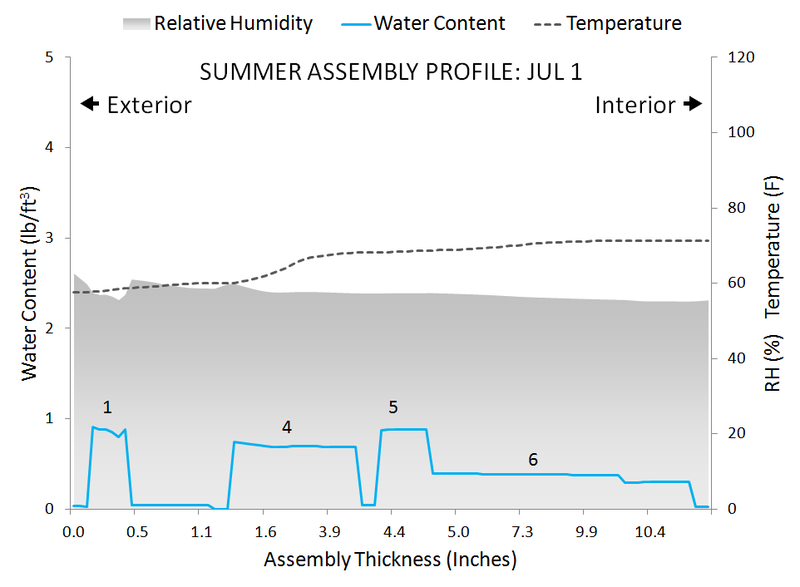 Likewise, our summer profile shows a near-uniform relative humidity gradient despite high exterior moisture burdens from the two wind-driven rain deposits. The wall achieves high resilience and remains well below moisture control criteria for the entire year. Other details of our analyses are found in Hygrothermal Snapshot No. 16. It might also surprise you that this wall doesn’t necessarily require an interior vapor retarder despite exposure to brutally cold Minnesota winters. Nonetheless, we see vastly improved performance using the Intello smart vapor membrane, which allowed us to significantly increase interior moisture levels while retaining superb moisture performance. By accommodating reasonable fluctuations in interior moisture, in addition to occasional extremes, the Intello membrane becomes an important feature of this high-performing wall. While this assembly might not claim ‘super wall’ status, it can certainly take more than its fair share of extreme conditions. And at R-30, it’s no energy lightweight. The combine attributes of resistance, thermal performance, and natural materials makes it a worthy competitor to any synthetic foam wall. Fully customizable for even greater energy performance, we see this wall serving many needs. Clearly, you don’t have to compromise performance for the sake of sustainability and environmental health.